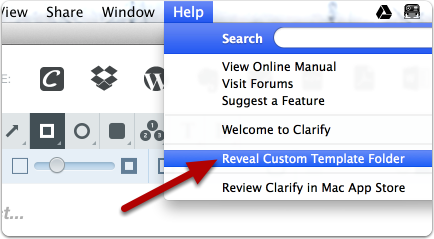 From the Help menu, select Reveal Custom Template Folder. In the Finder (OS X) or Windows Explorer (Windows) you will see the Templates folder revealed. 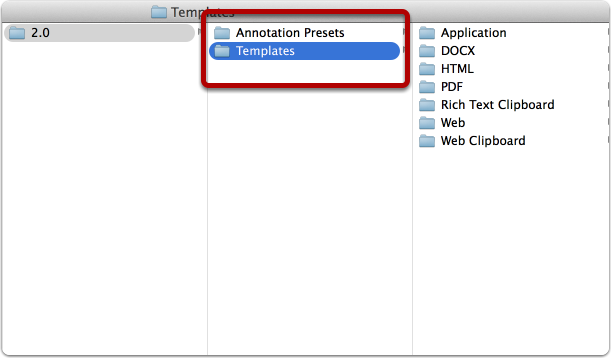 At the same level as the Templates folder is an Annotation Presets folder. You want to copy these two folders to the new computer. DO NOT just copy the 2.0 folder. On Windows Vista and later the Clarify preference file is stored alongside the Annotation Presets and Templates folder. The file is named be Clarify Preferences.dat. Copy that file to the new computer as well. The ~ symbol represents your home folder on the computer. Hi Natalia. A Windows-only license won't work on a macOS system. You would need to upgrade to the cross-platform license in order to register Clarify on macOS. Email support@screensteps.com and we can help you with that. You only have to pay the difference between a single-platform license and a cross-platform license.